We believe that competent and dedicated employees are the key to business success. That’s why we take no risks when choosing our staff. They are carefully selected for their technical know-how, interpersonal competence and linguistic skills. 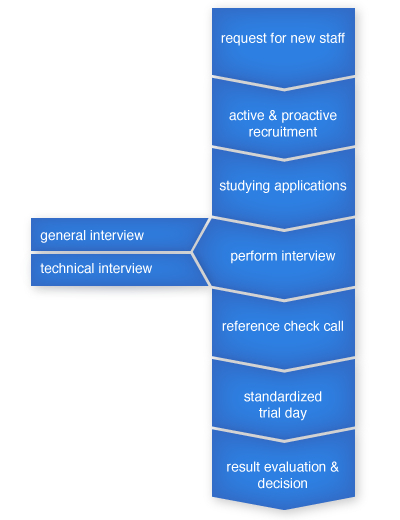 To make sure we select and hire the right people every time we use a fully featured, standardized and multilevel recruitment process. At centeractive experts are evaluated by experts: technical ability of prospects is thoroughly tested by our developers both during a technical interview and trial day with a pair programming session. Only this way we can be sure that we achieve the highest level of staff excellence.